On Sunday Q was kind enough to take me up to the farm where we picked 8 lbs. of blueberries and 12 lbs. of sweet cherries (both $1.25/lb.) and just enough peaches for Q to have snacks for a few days. The free stones won't be ready until August so no canning peaches for a while. I am aware that I have forsworn bananas because of the large number of food miles they carry but I couldn't help picking these up when we saw them at the grocery store on the way home. I mean, I come from a long line of bargain hunters and $.28/lb for the red bands was more than I could pass up. I assuage my guilt by telling myself that the market can't be making money at that price and they'd go to waste anyway if no one bought them. They add a lot of sweetness and body to the morning smoothies, which makes them pretty valuable in our eyes. So, yeah, that's what 35 lbs. of bananas looks like. 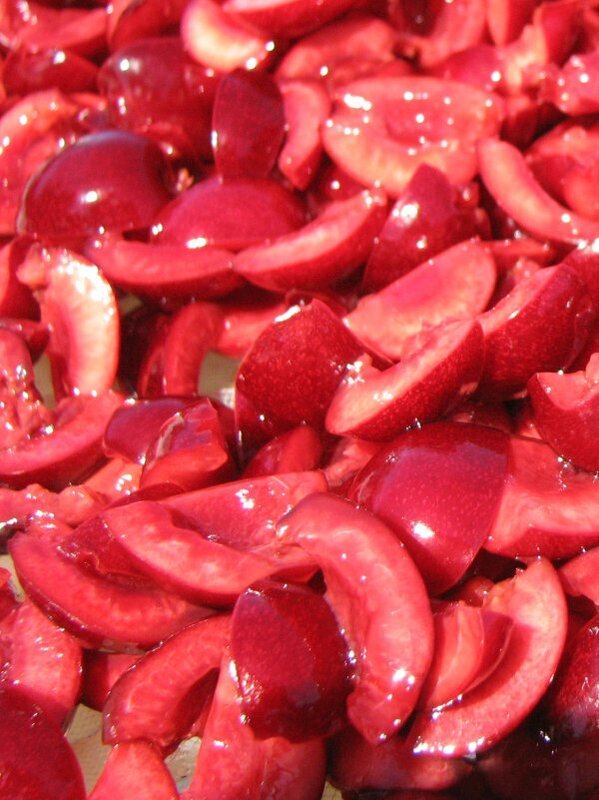 Q was awesome and pitted cherries while I quartered them into the citric acid water. It took less than 2 X-File episodes (we're watching through season 1 again) to get them all done when we double teamed them. The weather's been cool-ish ever since though and I think I need to resort to the electric dryer rather than solar. The blueberries were washed, frozen in single layers on rimmed baking sheets, and then poured into freezer bags. They made about 2 gallons and are also smoothie fodder. There are 8 freezer bags of bananas in the deep freeze along with a smaller bag in the upstairs freezer for the next few mornings. There were also some delicious peanut butter on banana incidents in the last few days. I took a bowl full of peels out this morning after I finished processing the last few pounds. I turned the compost a little to get to the center. The place where Q put the banana peels on Sunday is FULL of worms. A lot of them seem to be the red wigglers I released from our now defunct worm bin. I guess we now have a really big worm bin. I can't believe how quickly the compost is breaking down lately. Yay dirt! With all that fruit, I have to wonder... do you have a ton of fruit flies? If you have a remedy for the fruitfly pests... I would love to read it! 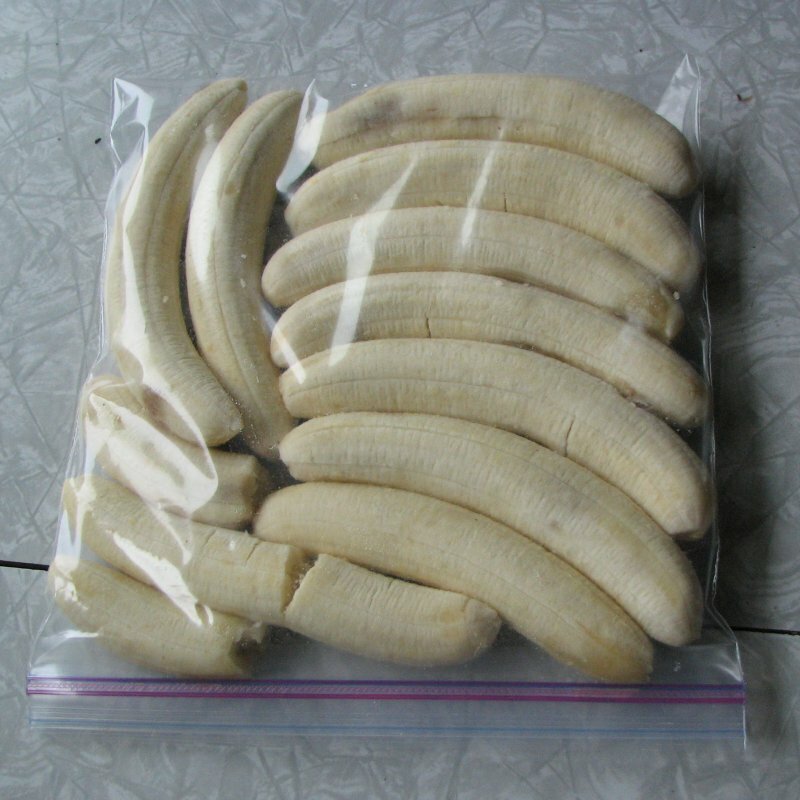 When we do get fruit flies, the thing we've found most effective is this type of arrangement - http://vegweb.com/index.php?topic=24872.0. We just use straight balsamic and ours isn't humane because we just let them drown and then empty and reset it every few days until everybody is gone. 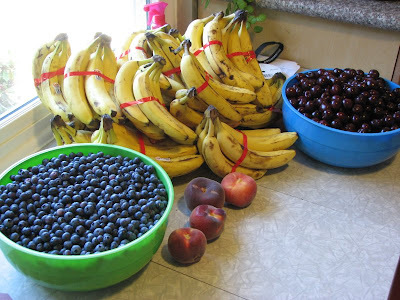 The biggest trick is simply only getting the amount of fruit that can be processed/used in a couple of days and keeping things that are clearly bruised/damaged in the fridge until use.